Details of all tracked flights made by G-LCYI in the past 30 days. For older flights please see Jet Tracker. Details of all routes operated by G-LCYI in the past 30 days. For older flights please see Jet Tracker. G-LCYI is configured with a convertible cabin and can operate in all-Economy configuration when used on charter flights and with between three and thirteen rows of Business Class when operating scheduled services. BA CityFlyer Embraer 170 G-LCYI positioned Paris Orly – London City this morning as BA9750. Following its diversion yesterday evening, BA CityFlyer Embraer 170 G-LCYI positioned London Stansted – London City this afternoon as BA9751 this afternoon then returned to service operating BA2212 London City – Edinburgh. BA CityFlyer E170 G-LCYI BA2286 London Stansted Diversion. BA CityFlyer Embraer 170 G-LCYI operating BA2286 Geneva – London City with a 90 minute delay diverted to London Stansted this evening having missed curfew at London City. BA CityFlyer E170 G-LCYI Returns from London Gatwick. Following its diversion on 22nd February, BA CityFlyer Embraer 170 G-LCYI positioned London Gatwick – London City this evening as BA9754. BA CityFlyer E170 G-LCYI BA8458 London Gatwick Diversion. BA CityFlyer Embraer 170 G-LCYI operating BA8458 Amsterdam – London City diverted to London Gatwick this evening due to weather at London City. BA CityFlyer Embraer 170 G-LCYI operated BA8763 London City – Zurich this morning, however the return BA8764 was cancelled due to a technical issue. The aircraft was able to position Zurich – London City early in the evening as BA9751. BA CityFlyer E170 G-LCYI Returns from Prague. Following the technical issue it encountered yesterday, BA CityFlyer Embraer 170 G-LCYI positioned Prague – London City this afternoon as BA9751. BA CityFlyer Embraer 170 G-LCYI, which has been under maintenance at Warsaw since 9th January, positioned Warsaw – London City this morning as BA9770. BA CityFlyer Embraer 170 G-LCYI positioned Frankfurt – Warsaw for maintenance late this morning as BA9769 after arriving as BA8732 from London City. British Airways B787-9 G-ZBKC Returns from Heathrow Maintenance. British Airways Boeing 787-9 G-ZBKC, which has been under maintenance at London Heathrow since 26th December, returned to service this afternoon operating BA5 London Heathrow – Tokyo Narita. British Airways B787-9 G-ZBKC Enters Heathrow Maintenance. British Airways Boeing 787-9 G-ZBKC entered the London Heathrow maintenance facility this morning after arriving as BA184 from Newark. BA CityFlyer Embraer 170 G-LCYI positioned London City – Warsaw for maintenance early this morning as BA9769. British Airways B787-9 G-ZBKC Positions to Cardiff Maintenance. British Airways Boeing 787-9 G-ZBKC positioned London Heathrow – Cardiff-Wales for maintenance this afternoon as BA9171. BA CityFlyer Embraer 170 G-LCYI, which has been under maintenance at Warsaw since 24th September, positioned Warsaw – London City this afternoon as BA9770. BA CityFlyer Embraer 170 G-LCYI, which did not operate in service today, positioned London City – Warsaw for maintenance this evening as BA9750. BA CityFlyer Embraer 170 G-LCYI, which overnighted at Isle of Man after arriving as charter flight BA4500 from Palma yesterday, positioned Isle of Man – London City this afternoon as BA9750. BA CityFlyer E170 G-LCYI Positions for Isle of Man – Palma Charter. BA CityFlyer Embraer 170 G-LCYI positioned Edinburgh – Isle of Man as BA4549 this morning in order to operate an Isle of Man – Palma charter rotation as BA4549/BA4500. The aircraft then overnighted at Isle of Man. BA CityFlyer E170 G-LCYI Completes Palma – Isle of Man Charter. Following its diversion to Edinburgh yesterday evening, BA CityFlyer Embraer 170 G-LCYI completed yesterday’s BA4500 Palma – Isle of Man charter this morning, routing Edinburgh – Isle of Man as BA4500. The aircraft then positioned Isle of Man – Edinburgh as BA9751. BA CityFlyer E170 G-LCYI Positions for Isle of Man – Palma Charter, Diverts to Edinburgh. BA CityFlyer Embraer 170 G-LCYI positioned Edinburgh – Isle of Man as BA4549 this morning in order to operate an Isle of Man – Palma charter rotation as BA4549/BA4500. However the BA4500 service diverted to Edinburgh during the evening due to weather at Isle of Man. BA CityFlyer E170 G-LCYI Operates Edinburgh – Zurich Charter. BA CityFlyer Embraer 170 G-LCYI operated an Edinburgh – Zurich charter this afternoon as BA4509. BA CityFlyer Embraer 170 G-LCYI, which has been out of service at Edinburgh since 21st July, positioned Edinburgh – London City this afternoon as BA9751 then returned to service operating BA8455 London City – Amsterdam. BA CityFlyer Embraer 170 G-LCYI positioned Edinburgh – Isle of Man as BA4549 late this morning in order to operate an Isle of Man – Palma charter rotation as BA4549/BA4500. The aircraft then positioned Isle of Man – Edinburgh, also as BA4500. British Airways B787-9 G-ZBKC Continues from Mauritius. Following its diversion yesterday, British Airways Boeing 787-9 G-ZBKC departed Mauritius late this morning continuing the diverted BA63 London Heathrow – Seychelles of 7th July, routing Mauritius – Seychelles as BA63, The aircraft then operated yesterday’s delayed BA62 Seychelles – London Heathrow. British Airways B787-9 G-ZBKC BA63 Mauritius Diversion. British Airways Boeing 787-9 G-ZBKC operating BA63 London Heathrow – Seychelles (depart London Heathrow 7th July) diverted to Mauritius this morning due to weather at Seychelles. The aircraft will overnight at Mauritius. British Airways Boeing 787-9 G-ZBKC, which has been under maintenance at London Heathrow since 8th June, returned to service this morning operating BA233 London Heathrow – Moscow Domodedovo. BA CityFlyer Embraer 170 G-LCYI positioned London Stansted – London City as BA9751 this afternoon in order to operate the delayed BA8455 London City – Amsterdam. British Airways Boeing 787-9 G-ZBKC entered the London Heathrow maintenance facility this morning after arriving as BA72 from Abu Dhabi. BA CityFlyer Embraer 170 G-LCYI Operates Dublin – Barcelona Charter. BA CityFlyer Embraer 170 G-LCYI operated a Dublin – Barcelona charter early this afternoon as BA7037. The aircraft then positioned Barcelona – London City, which also appears to have operated a BA7037. BA CityFlyer Embraer 170 G-LCYI operated an Edinburgh – Malaga charter rotation this morning as BA4517/BA4518. BA CityFlyer E170 G-LCYI Positions for Isle of Man – Menorca Charter. BA CityFlyer Embraer 170 G-LCYI positioned Edinburgh – Isle of Man as BA4549 late this morning in order to operate an Isle of Man – Mahon charter rotation as BA4549/BA4500. The aircraft then positioned Isle of Man – Edinburgh as BA4500. British Airways B787-9 G-ZBKC Calgary Cancellation. British Airways Boeing 787-9 G-ZBKC operated BA103 London Heathrow – Calgary this evening, however the return BA102 was cancelled. It is not yet clear whether this is due to a technical or a crew issue. BA CityFlyer E170 G-LCYI BA8472 London Southend Diversion. BA CityFlyer Embraer 170 G-LCYI operating BA8472 Florence – London City diverted to London Southend this afternoon due to weather at London City. The aircraft later positioned London Southend – London City as BA9751. British Airways B787-9 G-ZBKC Returns from Hyderabad. Following the technical issue it encountered yesterday, British Airways Boeing 787-9 G-ZBKC departed Hyderabad early this morning operating yesterday’s delayed BA276 Hyderabad – London Heathrow. British Airways B787-9 G-ZBKC Hyderabad Technical Issue. British Airways Boeing 787-9 G-ZBKC arrived into Hyderabad early this morning as BA277 from London Heathrow (depart London Heathrow 30th January), however the return BA276 has been delayed overnight due to a technical issue. BA CityFlyer E170 G-LCYI BA3270 London Southend Diversion. BA CityFlyer Embraer 170 G-LCYI operating BA3270 Dusseldorf – London City diverted to London Southend this morning due to weather at London City. The aircraft late positioned London Southend – London City as BA9752 in order to operate the delayed BA3271 London City – Dusseldorf. BA CityFlyer Embraer 170 G-LCYI, which has been under maintenance at Warsaw since 16th January, positioned Warsaw – Dusseldorf as BA9770 this afternoon then returned to service operating BA3276 Dusseldorf – London City. BA CityFlyer Embraer 170 G-LCYI positioned Edinburgh – Warsaw early this afternoon as BA9769. BA CityFlyer E170 G-LCYI BA2215 London Southend Diversion. BA CityFlyer Embraer 170 G-LCYI operating BA2215 Glasgow – London City with a two and a half hour delay diverted to London Southend late tonight having missed curfew at London City. BA CityFlyer E170 G-LCYI Dusseldorf Cancellation. BA CityFlyer Embraer 170 G-LCYI operated BA3275 London City – Dusseldorf this afternoon, however the return BA3276 was cancelled, officially shown as due to a technical issue. However two hours after the scheduled departure of BA3276 the aircraft positioned Dusseldorf – London City as BA9751. BA CityFlyer E170 G-LCYI BA2331 Verona Diversion. BA CityFlyer Embraer 170 G-LCYI operating BA2331 London City – Florence diverted to Verona this morning due to weather at Florence. The aircraft was able to position Verona – Florence as BA9753 early in the afternoon in order to operate BA2330 Florence – London City. BA CityFlyer E170 G-LCYI Operates Glasgow – Malaga Charter. BA CityFlyer E170 G-LCYI Operates Edinburgh – Malaga and Zurich Charters. BA CityFlyer Embraer 170 G-LCYI operated an Edinburgh – Malaga charter rotation early this morning as BA4517/BA4518. The aircraft then operated an Edinburgh – Zurich charter as BA4523. BA CityFlyer E170 G-LCYI Operates Multiple Charters. BA CityFlyer Embraer 170 G-LCYI operated a Zurich – Edinburgh charter this morning as BA4524. The aircraft then positioned Edinburgh – Humberside as BA4513 in order to operate a Humberside – Alicante charter rotation as BA4513/BA4514. Finally the aircraft positioned Humberside – Edinburgh, also as BA4514. 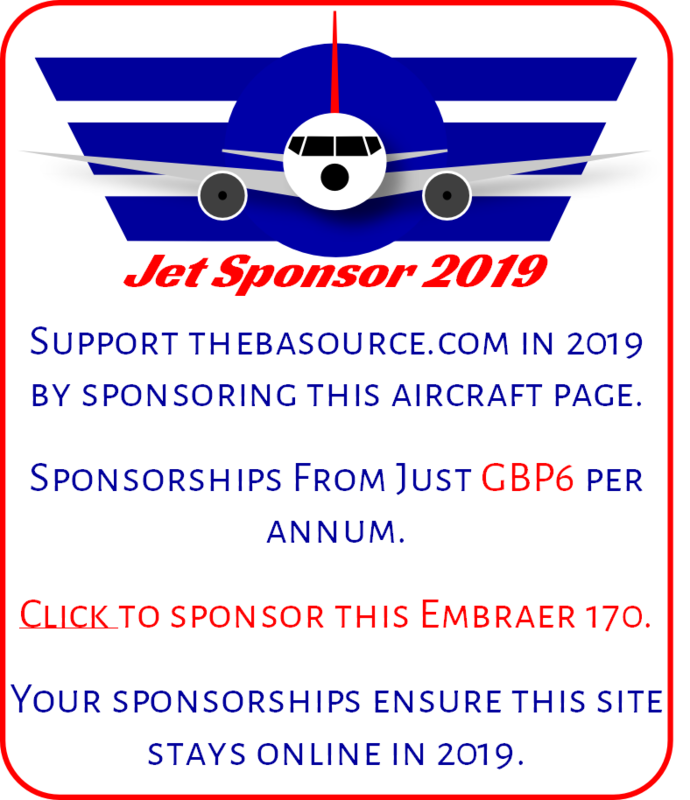 BA CityFlyer E170 G-LCYI Positions for Humberside – Alicante Charter. BA CityFlyer Embraer 170 G-LCYI positioned Edinburgh – Humberside as BA4513 this morning in order to operate a Humberside – Alicante charter, also as BA4513. The aircraft operated an Alicante – Humberside charter as BA4514 before positioning Humberside – Edinburgh, also as BA4514. BA CityFlyer Embraer 170 G-LCYI positioned Edinburgh – Humberside as BA4513 this morning in order to operate a Humberside – Alicante charter, also as BA4513. The aircraft then positioned Alicante – Edinburgh as BA4514. BA CityFlyer E170 G-LCYI Returns from London Stansted. Following its diversion last night, BA CityFlyer Embraer 170 G-LCYI positioned London Stansted – London City as BA9751 late this morning. BA CityFlyer E170 G-LCYI BA8472 London Stansted Diversion. BA CityFlyer Embraer 170 G-LCYI operating the heavily delayed BA8472 Florence – London City diverted to London Stansted late tonight having missed curfew at London City. BA CityFlyer Embraer 170 G-LCYI positioned Glasgow – London City as BA9750 this evening after arriving as BA8728 from London City. British Airways B787-9 G-ZBKC Returns from Tel Aviv. Following its overnight crew illness delay, British Airways Boeing 787-9 G-ZBKC departed Tel Aviv late this morning operating yesterday’s delayed BA164 Tel Aviv – London Heathrow as BA164D. British Airways B787-9 G-ZBKC Overnight Tel Aviv Delay. British Airways Boeing 787-9 G-ZBKC operated BA165 London Heathrow – Tel Aviv this morning, however the return BA164 has been delayed overnight due to crew illness. BA CityFlyer Embraer 170 G-LCYI operated an Edinburgh – Zurich charter this afternoon as BA4523. BA CityFlyer Embraer 170 G-LCYI operated a Zurich – Edinburgh charter this morning as BA4524. BA CityFlyer E170 G-LCYI Positions for Zurich – Edinburgh Charter. BA CityFlyer Embraer 170 G-LCYI overnighted at Geneva after arriving as BA2287 from London City yesterday, however its scheduled return to the UK as BA2342 Geneva – London Stansted was cancelled this morning and the aircraft instead positioned Geneva – Zurich as BA9751 in order to operate a Zurich – Edinburgh charter as BA4528. There was no BA CityFlyer aircraft available at Zurich to operate the charter due to the cancellation of BA8769 London City – Zurich yesterday. During the afternoon the aircraft positioned Edinburgh – Alicante as BA4513 in order to operated an Alicante – Humberside charter as BA4514. The aircraft then positioned Humberside – Edinburgh, also as BA4514. BA CityFlyer E170 G-LCYI Operates Florence – Bristol and Birmingham Rotations. BA CityFlyer Embraer 170 G-LCYI operated the inaugural BA7016/BA7017 Florence – Bristol rotation this morning and the inaugural BA7024/BA7025 Florence – Birmingham rotation this afternoon. BA CityFlyer Embraer 170 G-LCYI operated an Edinburgh – Malaga charter early this morning as BA4517. The aircraft then positioned back to Edinburgh as BA4518. BA CityFlyer E170 G-LCYI Operates Isle of Man – Menorca Charter. BA CityFlyer Embraer 170 G-LCYI positioned Edinburgh – Isle of Man as BA4549 late this morning in order to operate an Isle of Man – Mahon charter, also as BA4549. The aircraft then positioned Mahon – Edinburgh as BA4500. British Airways B787-9 G-ZBKC Takes Over BA143. Following the earlier technical return of BA143 London Heathrow – Delhi to London Heathrow, the delayed flight was operated this evening by British Airways Boeing 787-9 G-ZBKC. BA CityFlyer E170 G-LCYI Returns from Frankfurt Maintenance. BA CityFlyer Embraer 170 G-LCYI, which has been under maintenance at Frankfurt since 21st April, positioned Frankfurt – London City this evening as BA9750. BA CityFlyer E170 G-LCYI Positions to Frankfurt Maintenance. BA CityFlyer Embraer 170 G-LCYI, which spent yesterday out of service at London City, positioned London City – Frankfurt for maintenance this afternoon as BA9750. BA CityFlyer E170 G-LCYI Returns from London Southend via Training Mission. BA CityFlyer Embraer 170 G-LCYI, which overnighted at London Southend after operating training circuits yesterday, positioned London Southend – London City as BA9771 early this afternoon making several training circuits at London City. BA CityFlyer Embraer 170 G-LCYI positioned London City – London Southend as BA9771 early this afternoon in order to operate training circuits. Following its diversion yesterday, BA CityFlyer Embraer 170 G-LCYI positioned London Stansted – London City early this afternoon as BA9751. BA CityFlyer E170 G-LCYI BA3280 London Stansted Diversion. BA CityFlyer Embraer 170 G-LCYI operating BA3280 Florence – London City diverted to London Stansted this afternoon after missing weekend curfew at London City. British Airways B787-9 G-ZBKC Operated Delayed Middle East Services. British Airways Boeing 787-9 G-ZBKC, which operated yesterday’s BA73 London Heathrow – Abu Dhabi with a seven hour delay yesterday, operated the return BA72 this morning as BA72D. The aircraft then operated yesterday’s delayed BA109 London Heathrow – Dubai as BA109D. BA CityFlyer Embraer 170 G-LCYI operated BA3271 London City – Dusseldorf this morning then positioned back to London City as BA9751. BA CityFlyer Embraer 170 G-LCYI positioned Amsterdam – Dublin as BA9759 this evening after arriving as BA8459 from London City. BA CityFlyer Embraer 170 G-LCYI operated BA8459 London City – Dublin this evening, however the return BA8459 was cancelled and the aircraft insetad positioned Amsterdam – Dublin as BA9751. BA4470 London City – Dublin was also cancelled and the positioning flight was to ensure an aircraft was available tomorrow morning at Dublin. BA CityFlyer Embraer 170 G-LCYI, which has been under maintenance at Warsaw since 29th December 2016, positioned Warsaw – London City this afternoon as BA9770 then returned to service operating BA3277 London City – Dusseldorf. BA CityFlyer Embraer 170 G-LCYI, which has been out of service at Glasgow since 23rd December, positioned Glasgow – Warsaw for maintenance this morning as BA9769. BA CityFlyer E170 G-LCYI London City Training Missions. BA CityFlyer Embraer 170 G-LCYS operated two London City – London City training circuits as BA9771 this afternoon, each making several approaches. BA CityFlyer E170 G-LCYI BA3292 London Stansted Diversion. BA CityFlyer Embraer 170 G-LCYI operating BA3292 Hamburg – London City diverted to London Stansted this morning due to fog at London City. The aircraft positioned London Stansted – Hamburg as BA9755 late in the afternoon. BA CityFlyer Embraer 170 G-LCYI positioned London City – Dusseldorf as BA9751 this afternoon in order to operate BA3276 Dusseldorf – London City. BA CityFlyer Embraer 170 G-LCYI positioned London City – Dusseldorf as BA9750 this afternoon in order to operate BA3276 Dusseldorf – London City. BA CityFlyer E170 G-LCYI Edinburgh – Prestwick Training Mission. BA CityFlyer Embraer 170 G-LCYI operated an Edinburgh – Prestwick rotation for training purposes this morning as BA9771/BA9772. BA CityFlyer Embraer 170 G-LCYI positioned Edinburgh – London City late this morning as BA9751. BA CityFlyer Embraer 170 G-LCYI positioned Edinburgh – Humberside this morning as BA4513 in order to operate a Humberside – Alicante charter rotation as BA4513/BA4514, carrying passengers only on the Humberside – Alicante sector. The aircraft then positioned Humberside – Edinburgh also as BA4514. BA CityFlyer Embraer 170 G-LCYI positioned Edinburgh – Isle of Man as BA9783 late this morning to operate an Isle of Man – Palma charter rotation as BA9783/BA9874. The aircraft then positioned Isle of Man – Edinburgh as BA9784. BA CityFlyer Embraer 170 G-LCYI operated an Edinburgh – Zurich charter this afternoon as BA4510. BA CityFlyer Embraer 170 G-LCYI operated a Zurich – Edinburgh charter as BA4509 this morning, the aircraft then positioned Edinburgh – Isle of Man as BA9783 late this morning to operate an Isle of Man – Palma charter rotation as BA9783/BA9874. The aircraft then positioned Isle of Man – Edinburgh as BA9784. BA CityFlyer Embraer 170 G-LCYI operated a London City – London City training circuit this afternoon as BA9771T. British Airways B787-9 G-ZBKC Returns from Philadelphia. Following its diversion yesterday, British Airways Boeing 787-9 G-ZBKC positioned Philadelphia – London Heathrow this evening as BA9179. British Airways B787-9 G-ZBKC BA189 Philadelphia Diversion. British Airways Boeing 787-9 G-ZBKC operating BA189 London Heathrow – Newark was delayed out of London Heathrow due to a medical emergency on board and then diverted to Philadelphia due to weather at Newark. The aircraft is then shown as returning to the gate at Philadelphia where it will overnight. As a result BA188 Newark – London Heathrow was cancelled. BA CityFlyer E170 G-LCYI Operates Edinburgh – Palma and Geneva Charters. BA CityFlyer Embraer 170 G-LCYI operated an Edinburgh – Palma charter rotation early this morning as BA4475/BA4476 and an Edinburgh – Geneva charter this afternoon as BA4512. BA CityFlyer E170 G-LCYE Operates Multiple Charters. BA CityFlyer Embraer 170 G-LCYI operated a Geneva – Edinburgh charter as BA4511 this morning, then positioned Edinburgh – Humberside as BA4513 in order to operated a Humberside – Alicante charter rotation as BA4513/BA4514. The aircraft then positioned Humberside – Edinburgh also as BA4514. Following its training mission yesterday, BA CityFlyer Embraer 170 G-LCYI positioned London Southend – London City this afternoon as BA9772. BA CityFlyer Embraer 170 G-LCYI positioned London City – London Southend as BA9771 early this afternoon in order to operate training circuits as BA9772. BA CityFlyer Embraer 170 G-LCYI operated a Zurich – Edinburgh charter early this morning as BA4509. BA CityFlyer E170 G-LCYI Operates Isle of Man – Palma Charter. BA CityFlyer Embraer 170 G-LCYI operated BA4459 London City – Rotterdam this evening then positioned Rotterdam – Amsterdam as BA9752 in order to operate BA8450 Amsterdam – London City tomorrow morning. BA8457 London City – Amsterdam was cancelled this evening. BA CityFlyer Embraer 170 G-LCYI operated an Edinburgh – Palma charter rotation early this afternoon as BA4479/BA4500. BA CityFlyer E170 G-LCYI Operates Edinburgh – Milan Malpensa Charter. BA CityFlyer Embraer 170 G-LCYI operated an Edinburgh – Milan Malpensa charter rotation ths afternoon as BA4529/BA4530. BA CityFlyer 170 G-LCYI Operates Edinburgh – Palma Charter. BA CityFlyer Embraer 170 G-LCYI positioned Geneva – London City as BA9753 this morning to the schedule of the cancelled BA2280. BA CityFlyer Embraer 170 G-LCYI operated BA4459 London City – Rotterdam this evening then positioned back to London City as BA9752. BA CityFlyer E170 G-LCYI Operates Humberside – Alicante Charter. BA CityFlyer Embraer 170 G-LCYI operated an Edinburgh – Humberside – Alicante charter as BA4513 this morning, carrying passengers only on the Humberside – Alicante sector. The aircraft then positioned Alicante – Edinburgh direct as BA4514. British Airways B787-9 G-ZBKC Operates Houston Dreamliner Inaugural. British Airways switched operation of the BA197/BA196 London Heathrow – Houston rotation from Boeing 777 to Boeing 787-9 operation today with G-ZBKC operating the inaugural 787 service. British Airways B787-9 G-ZBKC Operates Delayed Kuala Lumpur Service. Following the technical return of yesterday’s BA33 London Heathrow – Kuala Lumpur to London Heathrow, the flight was operated this evening by Boeing 787-9 G-ZBKC as BA33D. BA CityFlyer E170 G-LCYI BA3279 Genoa Diversion. BA CityFlyer Embraer 170 G-LCYI operating BA3279 London City – Florence diverted to Genoa this afternoon due to weather. The aircraft then positioned Genoa – London City using callsign CFE752C. As a result BA3280 Florence – London City was cancelled. British Airways B787-9 G-ZBKC Returns from Newark. Following the technical issue it encountered on 2nd December, British Airways Boeing 787-9 G-ZBKC positioned Newark – London Heathrow late tonight as BA9174. British Airways B787-9 G-ZBKC Newark Technical Issue. British Airways Boeing 787-9 G-ZBKC operated BA189 London Heathrow – Newark this afternoon, however the return BA188 was cancelled due to a technical issue. British Airways B787-9 G-ZBKC Delivered. British Airways Boeing 787-9 G-ZBKC was delivered Paine Field – London Heathrow this evening as BA9158. The aircraft is in White Union Flag with Crest livery and 8F/42J/39W/127Y configuration. This is the third Boeing 787-9 for the airline. British Airways B787-9 G-ZBKC First Flight. British Airways Boeing 787-9 G-ZBKC made its first flight from Paine Field today as BOE364. BA CityFlyer Embraer 170 G-LCYI postioned Edinburgh – Palma using callsign CFE14J late this morning in order to operate a Palma – Isle of Man – Edinburgh charter as BA4542 carrying passengers only on the Palma – Isle of Man sector. Embraer 170 G-LCYI Operates Isle of Man – Mahon Charter Rotation. BA CityFlyer Embraer 170 G-LCYI operated an Edinburgh – Isle of Man – Mahon charter rotation as BA4541/BA4542 early this afternoon carrying passengers only on the Isle of Man – Mahon sectors. BA CityFlyer E170 G-LCYI Returns from Nice. Following the technical issue it encountered yesterday, BA CityFlyer Embraer 170 G-LCYI positioned Nice – London City this afternoon as BA9751. BA CityFlyer E170 G-LCYI Nice Technical Issue. BA CityFlyer Embraer 170 G-LCYI operated BA8475 London City – Nice this afternoon, however the return BA8475 was cancelled due to a technical issue with the aircraft. BA CityFlyer Embraer 170 G-LCYI operated an Edinburgh – Humberside – Alicante charter rotation as BA4513/BA4514 this morning, carrying passengers only on the Humberside – Alicante sectors. BA CityFlyer E170 G-LCYI BA4457 Amsterdam Diversion. BA CityFlyer Embraer 170 G-LCYI operating BA4457 London City – Rotterdam diverted to Amsterdam this evening due to weather at Rotterdam. The aircraft then positioned Amsterdam – London City as BA9750. As a result BA4458 Rotterdam – London City was cancelled. Following its diversion last night, BA CityFlyer Embraer 170 G-LCYI positioned London Southend – Rotterdam as BA9750 early this morning then returned to service operating BA4452 Rotterdam – London City. BA CityFlyer E170 G-LCYI BA8478 London Southend Diversion. BA CityFlyer Embraer 170 G-LCYI operating BA8478 Venice – London City diverted to London Southend this evening due to Air Traffic Control issues at London City. BA CityFlyer E170 G-LCYI Operates Zurich – Edinburgh & Humberside – Alicante Charters. BA CityFlyer Embraer 170 G-LCYI operated a Zurich – Edinburgh charter this morning as BA4509, the aircraft then operated an Edinburgh – Humberside – Alicante charter as BA4513, carrying passengers only on the Humberside – Alicante sector. The aircraft then positioned Alicante – Palma using callsign CFE45A in order to operate a Palma – Edinburgh charter as BA4500. BA CityFlyer Embraer 170 G-LCYI operated a Zurich – Edinburgh charter this morning as BA4509. BA CityFlyer E170 G-LCYI Operates Zurich – Edinburgh – Palma Charters. BA CityFlyer Embraer 170 G-LCYI operated a Zurich – Edinburgh charter this morning as BA4509 and an Edinburgh – Palma charter rotation this afternoon as BA4479/BA4500. BA CityFlyer Embraer 170 G-LCYI operated a Zurich – Edinburgh charter as BA4509 this morning and an Edinburgh – Palma charter early this afternoon as BA4479/BA4500. BA CityFlyer E170 G-LCYI Cambridge Training Flight and Return to London City. BA CityFlyer Embraer 170 G-LCYI operated a Cambridge – Cambridge training flight as BA9771 this morning then positioned Cambridge – London City as BA9772. BA CityFlyer E170 G-LCYI Operates Isle of Man – Mahon Charter. Following its diversion last night, BA CityFlyer Embraer 170 G-LCYI positioned London Stansted – London City this morning as BA9750. BA CityFlyer Embraer 170 G-LCYI operating BA3280 Florence – London City diverted to London Stansted late tonight. BA CityFlyer Embraer 170 G-LCYI, which has been under maintenance at Warsaw since 27th March, positioned Warsaw – London City this afternoon as BA9752. British Airways Embraer 170 G-LCYI positioned London City – Warsaw for maintenance this afternoon as BA9769. BA CityFlyer Embraer 170 G-LCYI overnighted at Zurich after arriving as BA8769 from London City yesterday evening, however its scheduled return to London City as BA8760 was cancelled this morning due to crew illness. The aircraft was able to position Zurich – London City during the afternoon as BA9751. BA CityFlyer E170 G-LYCI Positioning Flight. BA CityFlyer Embraer 170 G-LCYI operated BA8769 London City – Zurich this evening, then positioned back to London City as BA9751. As a result tomorrow’s BA8760 Zurich – London City will be cancelled. BA CityFlyer Embraer 170 G-LCYI, which has been under maintenance at Warsaw since 18th January, positioned Warsaw – London City this evening as BA9751. BA CityFlyer E170 G-LCYI BA8450 London Southend Diversion. British Airways E170 G-LCYI operating BA8450 Amsterdam – London City diverted to London Southend this morning due to fog at London City. The aircraft then positioned London Southend – Frankfurt as BA9752.